MEC 10 km: Personal best!!! 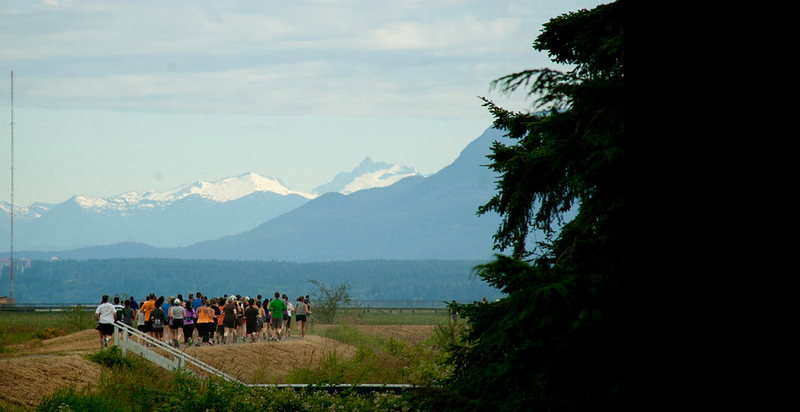 Beyond a couple tweets, I pretty much kept my participation in the Mountain Equipment Co-op 10 km race hush-hush. I didn’t want to put a huge amount of pressure on myself, I didn’t want extra stresses on my brain, or to feel like I’d be less if I didn’t meet my goals. 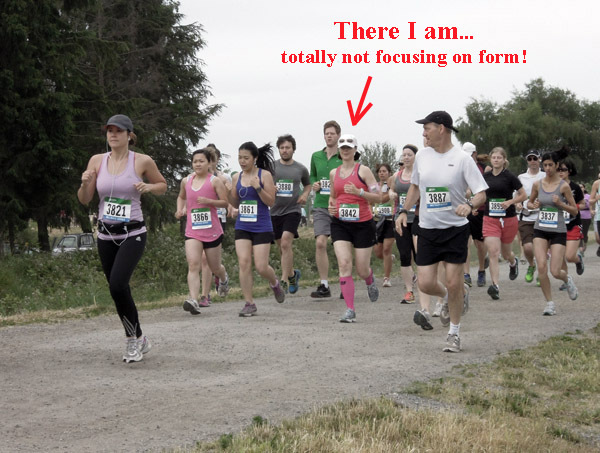 This race wasn’t necessarily supposed to be about getting a great time, but more about getting my body, belly, blood sugars and brain used to racing again. My goals were simple: Run hard. Don’t give up. I thought it was a good plan. Coach NZ thought it was a good plan. My competitiveness, however, did not. Saturday night I pulled out my race pace calculator, just out of curiosity, you know, to see what kind of pace I’d have to go to get 55 minutes, 54, 53, 52 – all of which seemed doable. That’s when I knew this would be more than just a hyped-up training run! That’s when I knew I’d be full-on racing! The MEC race was a super small event with just 86 of us running the 10 km portion. And because it was only $15, there was no souvenir shirt, no medal, no swag, which I was totally okay with. But there was also no timing chip system. Instead, there was a big clock (that was started for the half marathoners) with volunteers jotting down the bib numbers of the runners as they crossed the finish next to the time on the clock. Everyone had the same start time regardless of where they were positioned in the cue. Not exactly the most accurate system, which is why I’m going with my Garmin time. The route was an out-and-back, which I’m not generally a fan of, but along the dykes of the Steveston waterfront, it was freaking gorgeous! I had the water next to me, the mountains in front of me, and airplanes flying not so high above as they descended towards YVR. With about 600 metres to go, I spotted Big Ring and Little Ring, and suddenly my legs were like those of cheetah. I surged, I sprinted, I pumped my arms, I gave it my all! And when I crossed that finish line, my gawd, my legs could hardly hold me up they were shaking so bad! And those, my dear blog-reading friends, are legs that got me a PERSONAL BEST!!! The volunteers were awesome; super loud cheers and mega-watt smiles! My previous PB 56:01 – 21 seconds faster today! Wahoo! 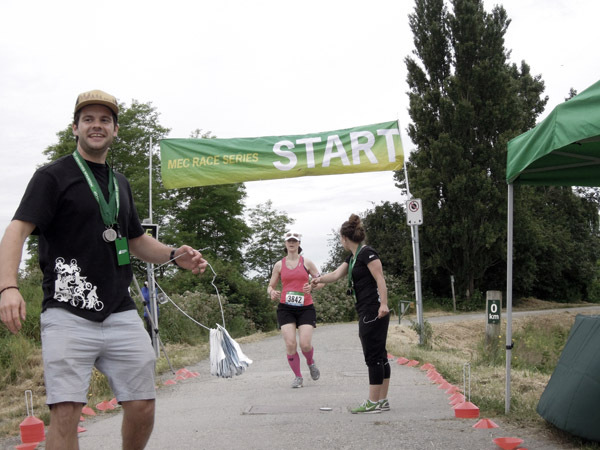 This entry was posted in Diabetes, Races, Running, Uncategorized and tagged 10 km, personal best, Revolutionz Coaching, Steveston, Vancouver MEC Race Series. Bookmark the permalink. So, many congrats on pulling it out of the hat and copping a personal best! !